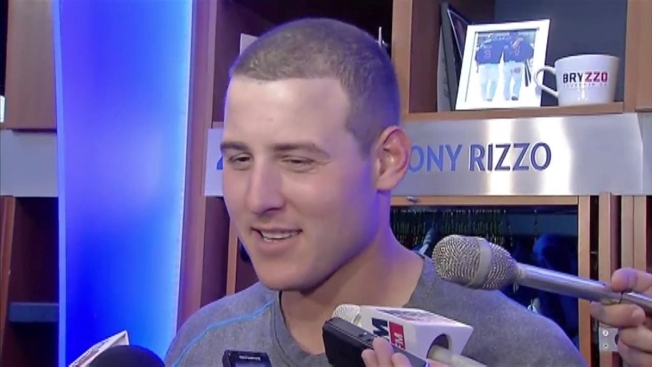 Anthony Rizzo talks about how the team celebrated his engagement last week. Anthony Rizzo is keeping the offseason exciting. The Cubs star got married over the weekend – but not without some of his teammates (old and new) by his side. The stunning wedding day was apparently also filled with fellow baseball stars like ex-Cub Dexter Fowler, retired Cub David Ross and possibly even Kris Bryant. Rizzo was spotted playing golf with Fowler and Ross at the Blue Monster Golf Course in Doral, just outside Miami. Because it wouldn’t be a wedding without #Bryzzo, right? Dexter Fowler later posted a photo with his wife and daughter at the wedding. “Congrats to the Rizzo’s @arizz_44 @rizzoem on your big day! We had a blast. #family,” he wrote. The Cubs first basement first announced his engagement to Emily Vakos in June of 2017.